This month of September, hundreds or even thousands of jobs for Filipino workers are now open in Japan. 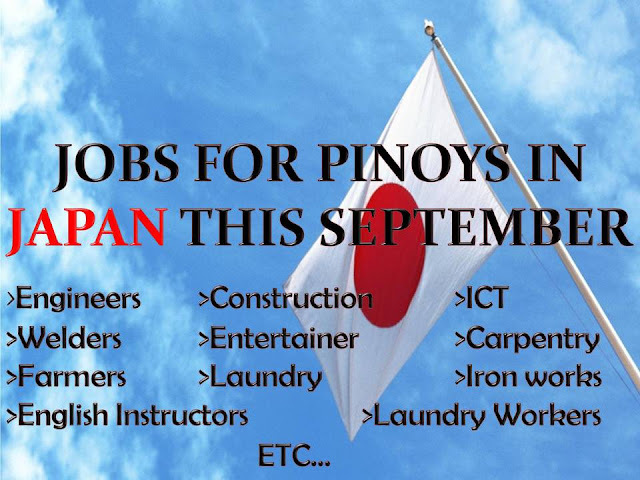 Different Japanese companies are looking for engineers, English instructor, construction workers, farmers, entertainers, poultry and dairy workers and other job opportunities for skilled and unskilled workers. Job listing below and their corresponding agencies are approved by POEA. Please be reminded that we are not a recruitment industry nor are we affiliated to any agency mentioned here below. All the job orders was taken from the POEA jobs order website and was only linked to agency details for easier navigation for the visitors. POEA APPROVED JAPAN JOBS, NEW ZEALAND JOBS, TAIWAN JOBS, GERMANY JOBS, KSA JOBS HERE!